Back on August 29, I posted a photo of a praying mantis from here in Aurora, Nebraska. Kathy from Omaha posted a comment that she’d seen more mantids this year than ever and wondered why. I naively suggested that it wasn’t necessarily that it was a good year for mantids, but that it’s the time of year when they become adults and start flying – making them easier to see and more widespread. I went back to the same prairie in early September and photographed a big mantid feeding on a sphinx moth (A Fuzzy Meal) and saw a few more mantids nearby. 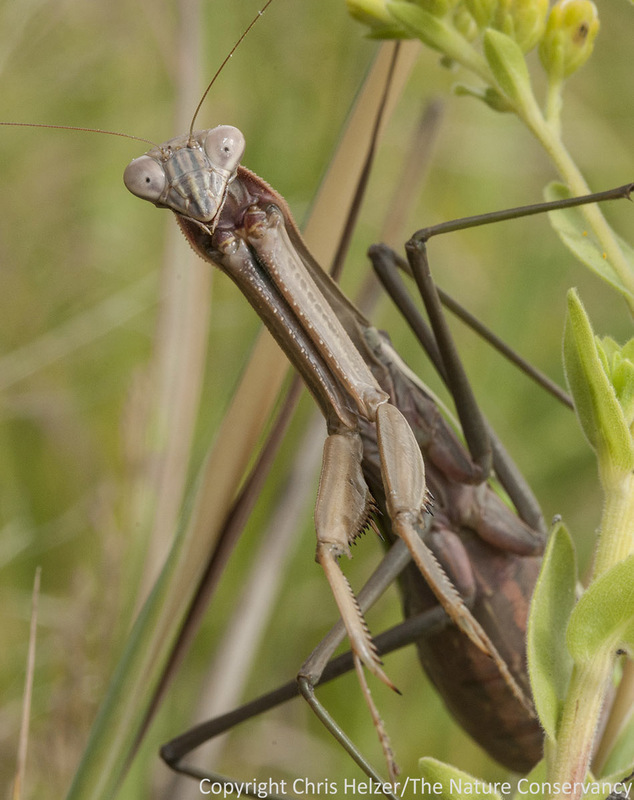 Then, last weekend, I took another short walk in that prairie and saw about a dozen mantids within 15 minutes. What is going on?? Are other people seeing this many around this year? Chinese praying mantis. Lincoln Creek Prairie – Aurora, Nebraska. A closer look at the above mantid. A mating pair. And no, the female doesn’t (usually) eat the male when they’re done. They sure are compelling little creatures, aren’t they? Interestingly, I found another praying mantis eating a sphinx moth on my walk last weekend. I wouldn’t have guessed that sphinx moths were a favorite food of mantids – or one that’s particularly easy to catch. On the other hand, I also noticed that most of the mantids I saw were sitting on or just beneath the flowers of pitcher sage (Salvia azurea) plants – just as the one in the last photo above is. It’s likely more than a mere coincidence that most of the sphinx moths I’ve seen flying in that prairie were feeding on pitcher sage… Wouldn’t you love to see that predation event in person? This entry was posted in Prairie Insects, Prairie Natural History, Prairie Photography and tagged aurora, close-up photo, grassland, insect, macro photography, mantid, nebraska, photography, prairie, praying mantis by Chris Helzer. Bookmark the permalink. 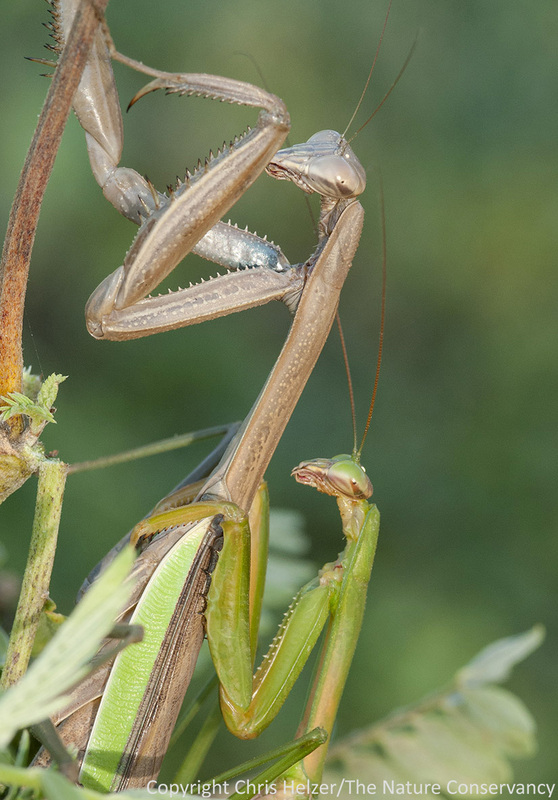 Apparently a praying mantis is quite the predator. You comment here and in the previous post you observed them feeding on sphinx moths. A landowner here in central Illinois sent a colleague of mine a photo of a praying mantis that had captured and was feeding on a hummingbird! Now that would be a predation event worth seeing! Hey Chris – my colleague and I found one here in Dane County, WI this past week as well. Not something we see everyday….. I have also noticed a lot more sphinx moths too. The mantids should have enough to eat. I think part of what fascinates me about mantids is that they seem to be looking back at me. Other insects rarely seem to notice I’m there. Thanks for the photos! I can’t count the number of times I’ve read or heard that female mantis’ rip the head off their partner at the end of mating. If it isn’t true, I wonder where the idea came from. It’s is rather disturbing thought. My understanding is that the story started from captive mantids. Under those circumstances, a gal probably eats whatever she can catch! In my entomology class I learned that males are expected to bring the female a nuptial gift, a prey item he has captured for the female to eat. If he does not he is more likely to be eaten by the female. However, some clever males learn that you can simply bring some mud and plant material. While the female is busy trying to figure out what it is, the male copulates. By the time the female realizes there is no food, the male has gone on his way. I agree, I have been seeing a lot of preying mantis around this year. Even saw a native mantid on my peach tree. Funny. Now that you mention it, I remember my sister telling me that the adult would eat the babies if she didn’t separate them right away. She has raised them many times, and I’ve heard some pretty funny stories. Once she forgot an eggcase in the car and found hundreds of the babies in her car. Maybe she was exaggerating, but the photos sure looked like hundreds. She sent me some pretty cool photos of the babies on her fingertip too. They were so tiny. Amazing little critters. Here on our little 10 acres in south central Kansas, I’m seeing more mantids this summer than I’ve seen in total since we moved here, 6 1/2 years ago. Most of the time I don’t see them actually eating prey, although last week I found one eating a skipper on Liatris and just this morning one was eating a fly on giant ragweed. I had posted earlier about a female mantid perched in goldenrod in my prairie garden…spent about a week there. Last weekend, a male came calling and was clinging to her just like in your photo. Hadn’t seen that before! I think you are failing to notice a serious problem here. Those are not a native species! The critter that is devouring small birds and beautiful moths is an asain invader. It is a serious threat to native species. In Kansas, any mantid over 48mm (less than 2 inches)is not native. Everyone that you see needs to be captured or killed. Do not buy mantid or ladybugs from greenhouses or catalogs unless they can prove the species. You are also acquiring our asain honeysuckle vines and bushes from your southern friends. They need to be eradicated or you will be sorry! Janeen – you’re right, of course. I’m not really happy about having Chinese mantids around here, but I’m not sure there’s anything to be done about it at this point. I have a hard time believing they’re making much of a dent in any of our native species’ populations, even at the abundance I’m seeing this year (which appears to be higher than previous years). Unfortunately, I’m afraid Chinese mantids are one of the new species we just have to learn to live with. I’m much more concerned about honeysuckle (which is in the woodland right next to the prairie I’ve been seeing the mantids in), which can change the entire community structure of a woodland. That one definitely needs to be nipped in the bud if at all possible. I have had several in my yard this week. On Monday I had a Monarch butterfly emerge from its chrysalis and before I could get it tagged to migrate, a Chinese mantid got it and had a fine dinner! Are you all sure these are a native species of Mantis. The giant mantis is of Asian origin and is probably having a negative affect on native insects. It would be nice to get these identified by an expert. 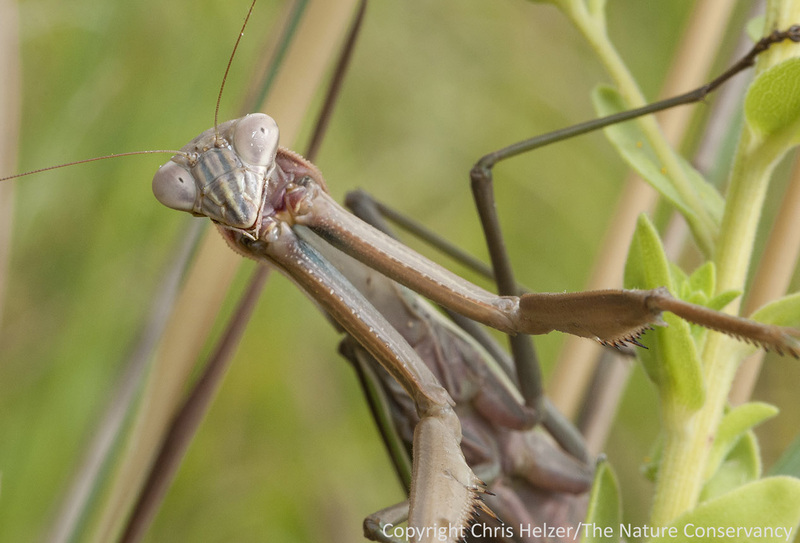 Chris – I truly love your posts and the mantises are fascinating and truly photogenic. I have smiled or laughed silently to myself more than once in the last few days thinking about the mantis trying to push the fuzz off of her face. You know someone should write a children’s story about the world from the point of view of a praying mantis. Your photos would make wonderful illustrations. I’ve only seen one mantis egg case in my life until this year-my wife and I found 4… I’ve noted a great spike in mantis sightings as well. There seems to be a lot of sphinx moths this year too. Although mantids aren’t native, I’m not (yet) convinced they’re a serious issue… I doubt that a hundred mantids could eat as many insects as a single flycatcher. Chris: I really like your macro shots and was wondering what macro (or micro if you shoot Nikon) lens you are using. I have two DX bodies and would love to be able to capture the small creatures. Hi Jim, I use a Nikon D300s camera with a Nikon 105mm macro lens. I love it. Everything here was shot with a tripod as well. I’m glad you enjoyed the photos! They look like cartoon characters with bugged out eyes! Great pictures. 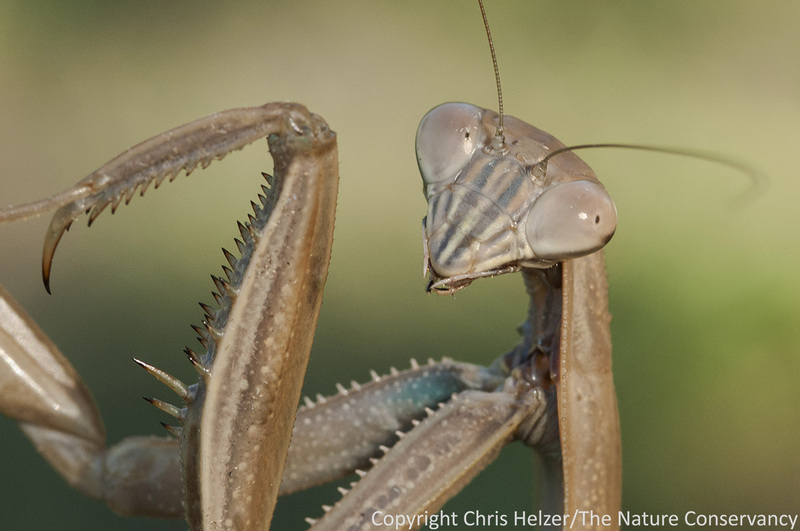 I wonder if the mantis is seeing it’s reflection in your lens and is asking the question if it’s a meal or a threat. The mantids seem to enjoy being photographed. 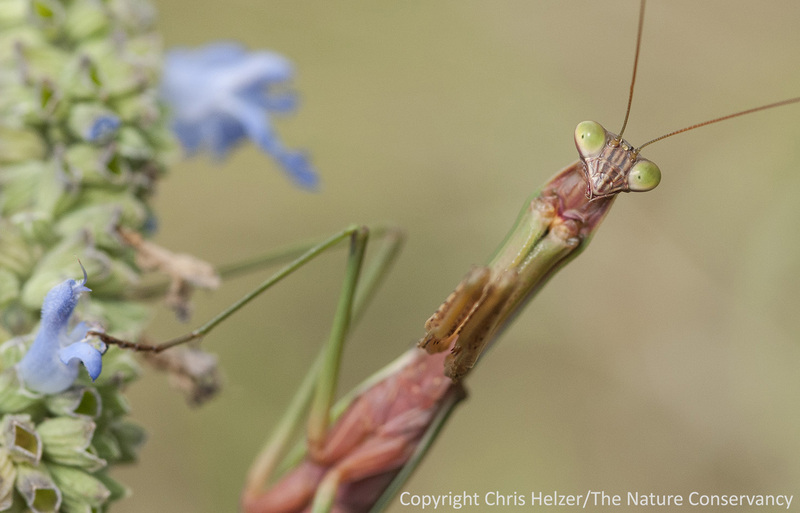 Chis: Apropos nothing in this mantid post, the PBS station in Philadelphia broadcast “Great Plains: America’s Lingering Wild” on Sunday evening, so I got to see you “in action.” It’s a great program all around; inspirational, really. I think these pictures are very interesting, however the mantids are a little creepy. Hi Chris! My husband found your post and forwarded it to me, we just arrived to the Lincoln area, and last night we caught 3 mantids! (I collect them). Just two days before that we caught another one! I hadn’t seen one in two years in Michigan, and then we come here and I see four in a few days? Pretty exciting. Also, we found ours when it was dark out (early night or early morning) and they were hanging out near lighted buildings, and not on grass. I assumed they just would find more bugs near light. I have four now, and I can’t tell if they are male or female, would you know how to tell? Brynn, I’m no expert, but the females here tend to be quite a bit larger than males. Here’s a website that talks about some other general differences. It sounds like wing length relative to body size might be a good clue – especially if you have fully-grown adults. A little late to the party here, but I’ve seen more mantises this year in Omaha than I have in the two previous decades combined. It’s like they’re not even trying to camouflage themselves anymore either. I’ve found them on parking garage stairs, on my screen door a few times, on electrical boxes, middle of the sidewalk, just about anywhere.